Steve volunteers at our local community garden, and today they’re having a picnic to celebrate the Summer Solstice. So at his request I sent him off with a big colourful bowl of Mexi-style salad. There’s no real recipe for this, it changes depending on what I have, but does always include a red (kidney, borlotti, pinto) bean and corn. To me it’s more about a colourful mix of yummy ingredients. 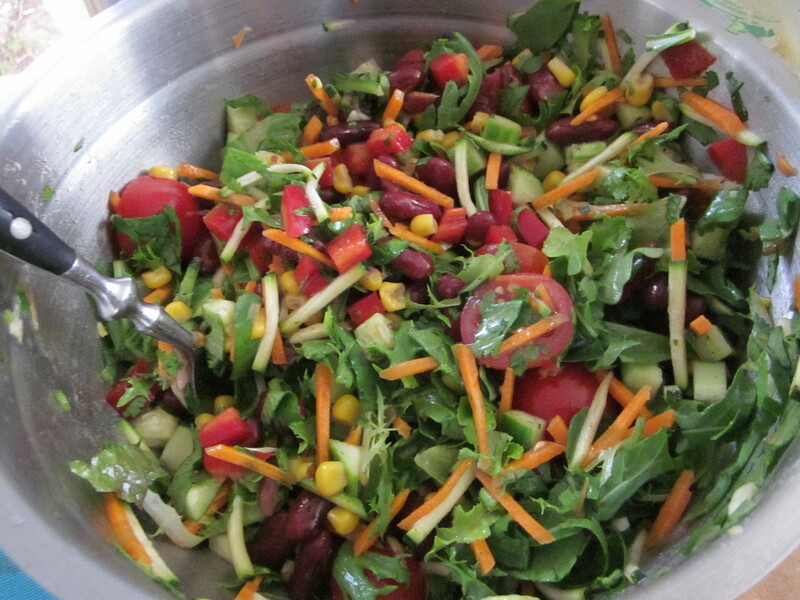 Today’s has kidney beans, corn, red capsicum, cucumber, carrot, zucchini, cherry tomatoes, avocado, leafy greens and lots of fresh coriander. Everything is chopped into smallish pieces or julienned, then the dressing is mixed through so the flavours have time to develop. The dressing is lemon and lime juice with olive oil, salt, pepper, cumin, chilli and coriander. I did keep a little back to have with some roast vegies for my own lunch.